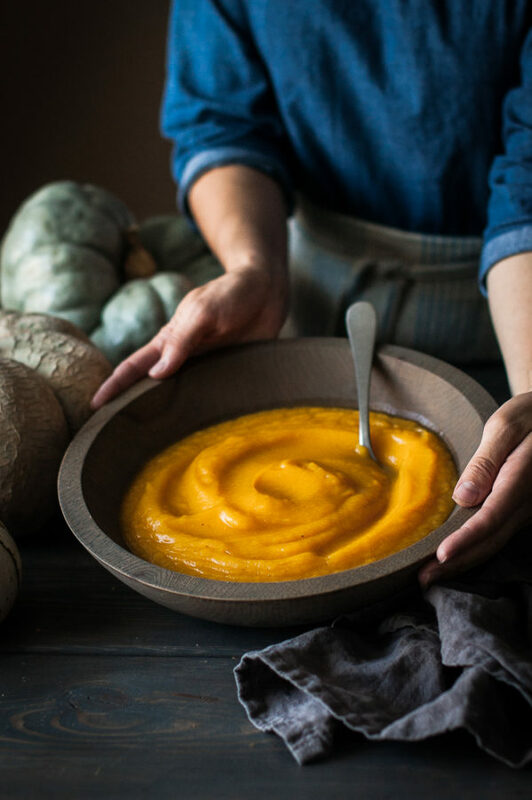 *Pumpkin Puree doesn’t have to come from a can! 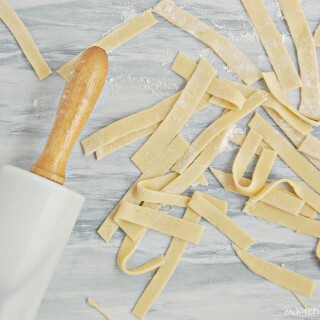 Homemade is infinitely better, in my opinion. 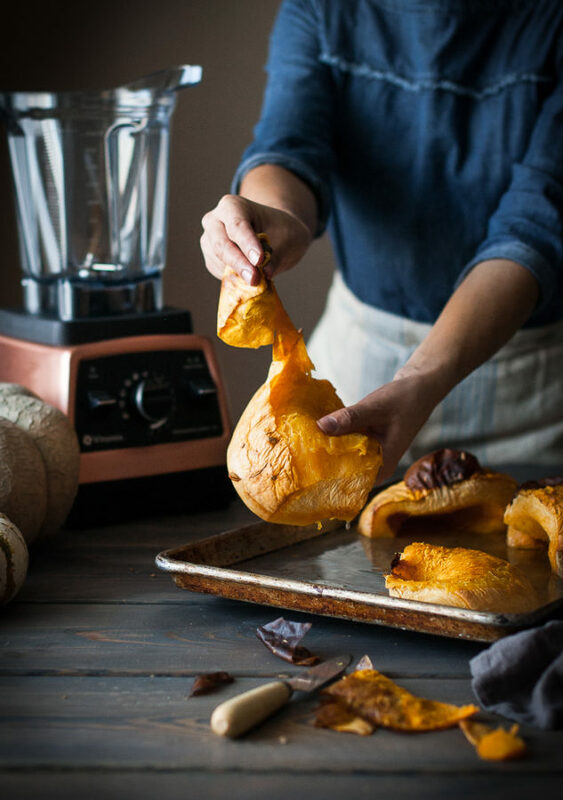 Let me show you how to make your own super smooth, sweet, and flavorful pumpkin puree with ease. I’ve always liked pumpkins. Not in a manic, obsessive sort of way, but more your typical “hey, that’s a pretty blue sky” sort of way. 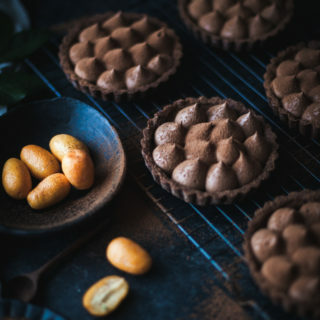 Observant of their beauty and merited place in the culinary world, but certainly never going out of my way to cook with them or admire their endless varieties. 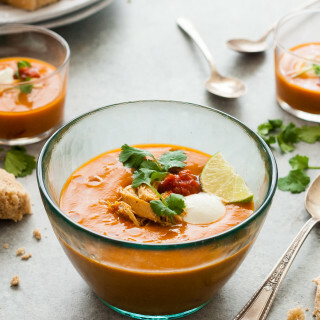 If I cooked with pumpkin, it was on occasion and that occasion was making this Curried Coconut Pumpkin Bisque. 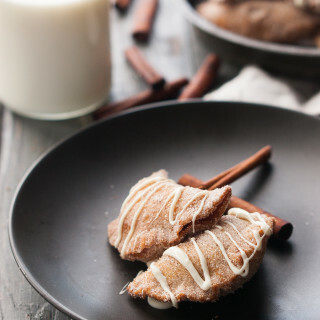 If I baked with pumpkin, or had the urge to make my own pumpkin puree, little sugar pumpkins were my go-to. And to be down-right honest, I was never all too smitten with them. For something called a sugar pumpkin I never really felt it lived up to it’s name, being just “ok”, at best. 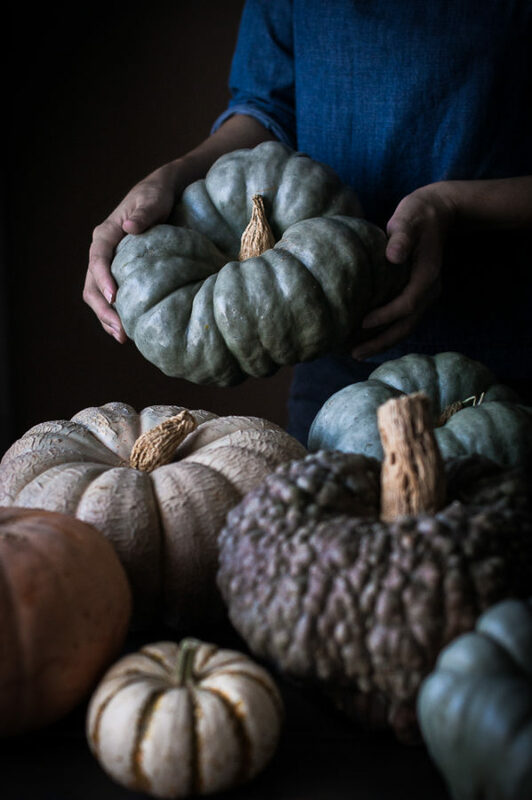 Every preconceived notion I had regarding the “wow factor” possessed by pumpkins (and squash, really) was obliterated this fall as I walked into a local market to buy a few green pumpkins for a shoot and was met by an array of colors, textures and sizes. Grey/green pumpkins the size of a small child with steep ridges and smooth skin that glistened with an almost metallic sheen. 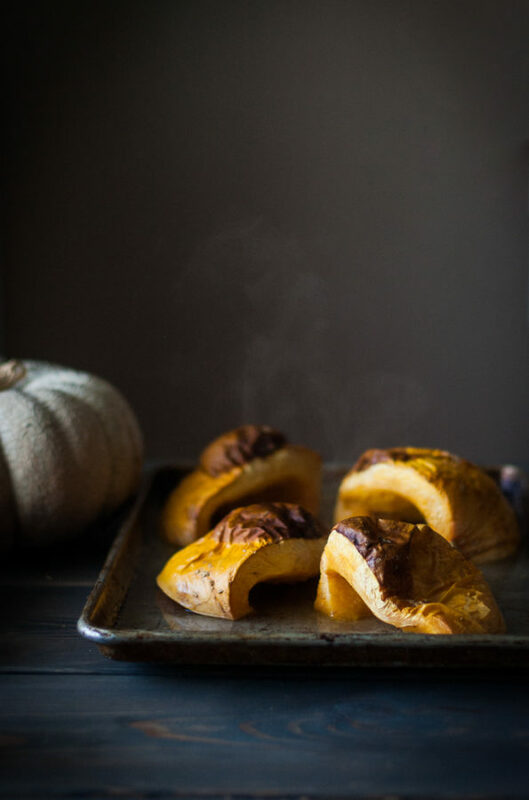 Fat blush colored pumpkins crusted with what can only be described as a peanut shell-like coating, stunning in their bizarre appearance. Deep purple-green squash that looked like giant acorns, with fabulously bumpy skin reminiscent of the skin of a fairytale troll. So many pumpkins and squash that I had never seen before in my 32 years. Or maybe I’ve just never noticed them? Sufficed to say, I bought more pumpkins this year than in my whole adult life combined. There is just something about the remarkable diversity and imperfect beauty of these pumpkins that make my heart beat faster and put butterflies in my stomach. The biggest mistake I now see in my former pumpkin-baking years is limiting myself to only pumpkins. 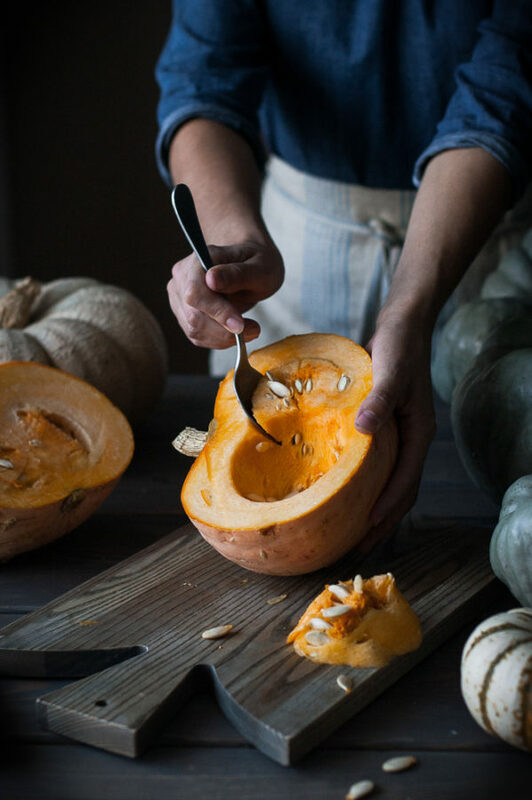 As it turns out, most canned pumpkin comes from other varieties of squash – not actual pumpkin. What does that mean?! 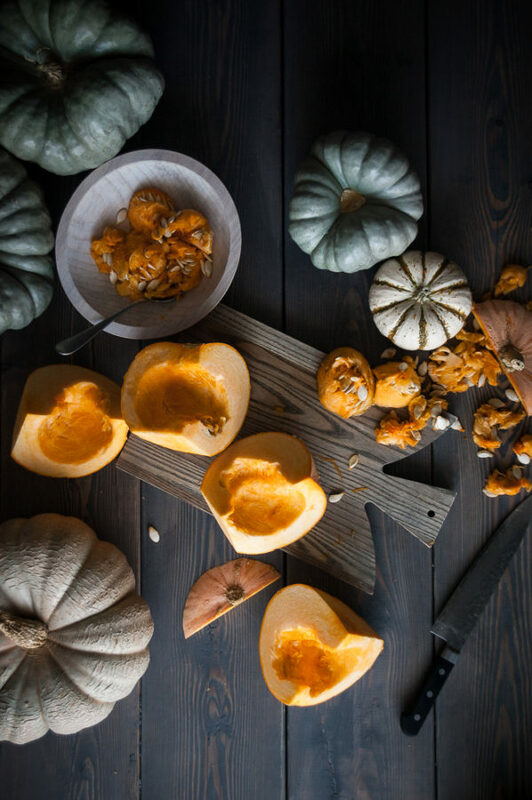 Time to break out of the box and start using the squash that we purchase to decorate our front porches and dining tables. 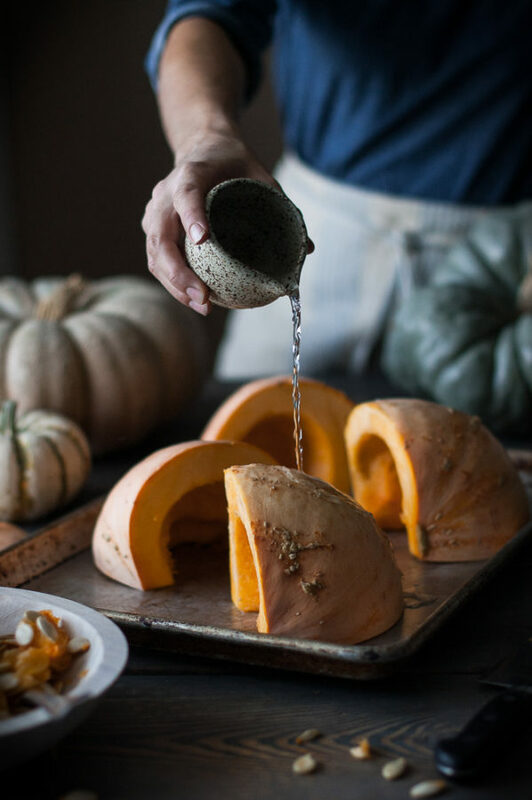 Decorative squash is so much more than something pretty to look at. 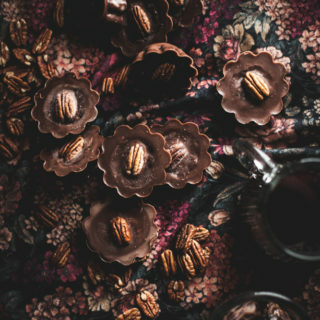 There is some serious substance hiding behind those unfamiliar squashy, rumpled beauties, not to mention a whole other world of rich texture and flavor. Not sure which pumpkins and squash are good for what, or what their flavor profiles may be? 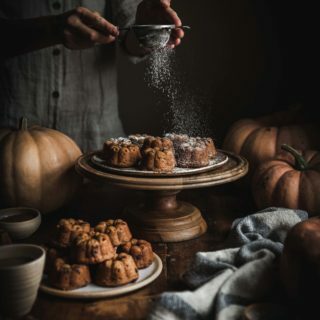 I came across this post by White on Rice Couple that gives you a visual guide to all things pumpkin and squash and it is remarkably helpful. 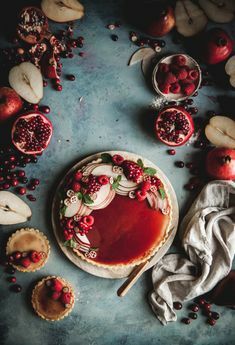 They list, along with pictures, several varieties of winter squash and pumpkins, along with what they taste like and how to cook them. 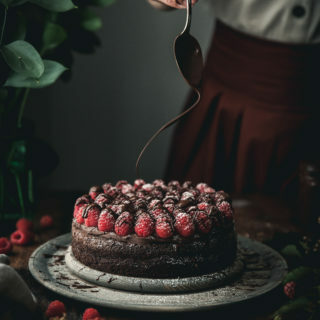 It is a fantastic resource for anyone wanting to know more, or just what variety they may have stumbled across at their local farmers market. 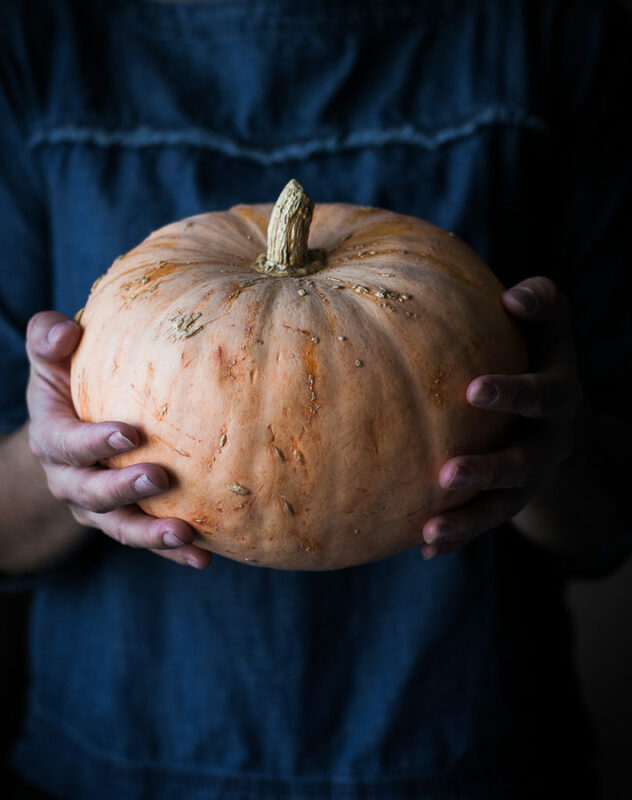 Choose a pumpkin or winter squash and wash the outside skin before diving in. Use a sharp chefs knife to cut it in half, keeping to one side of the stem. 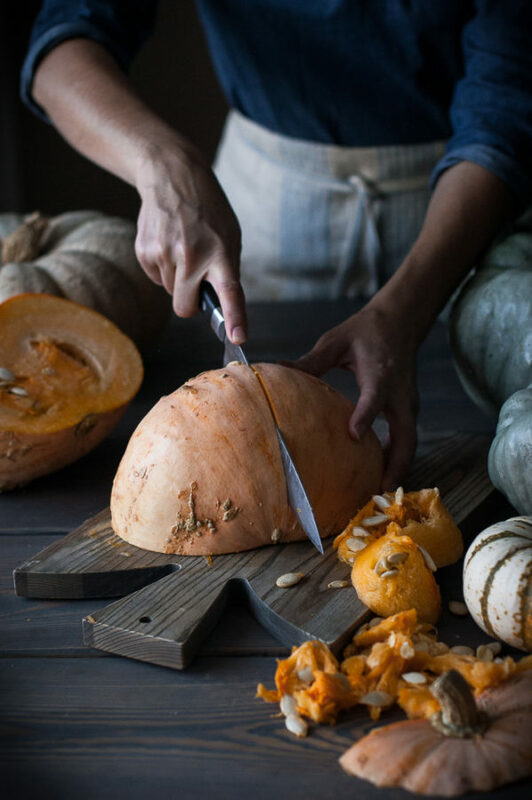 Use a large spoon to scrape out the seeds and stringy flesh from the inside of the pumpkin halves (discard seeds or save to roast later). Cut the top stem and bottom knub off of the pumpkin and cut both halves in half again so that you have four quarters. If you are using a really large pumpkin you may want to cut in into six’s or oven eighths. Place the pumpkin wedges cut side down on a baking sheet and pour enough water on the sheet to just cover the bottom. Place the sheet pan in the oven on the middle rack and roast the pumpkin at 400 degrees for 30-45 minutes. Length of time will depend on size and thickness of pumpkin quarters. 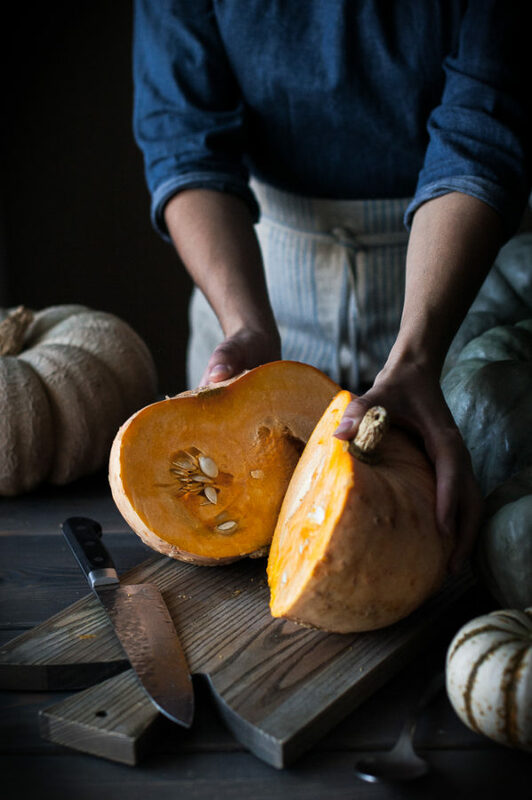 Pumpkin is cooked when a fork pierces the flesh with ease – it should be very tender. Remove the pan from the oven, drain off the water, and let the pumpkin cool until you can easily handle it. Using your hands, peel the skin off of the pumpkins. Use a small knife to cut off any skin that doesn’t readily pull back. 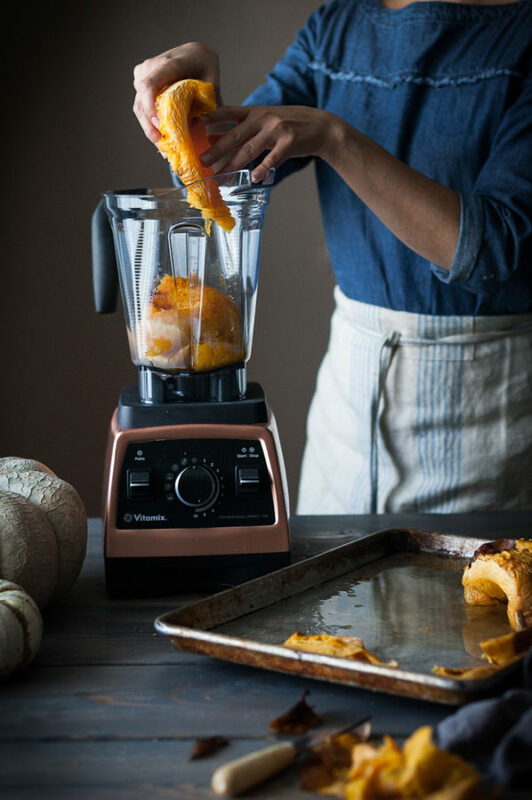 Place the skinless pumpkin flesh in a blender or food processor (my Vitamix made this process almost effortless), place the lid on the blender, then puree for 30 seconds to one minute, or until smooth and silky. You may need to scrape the sides down a time or two to get all of the pumpkin pureed. 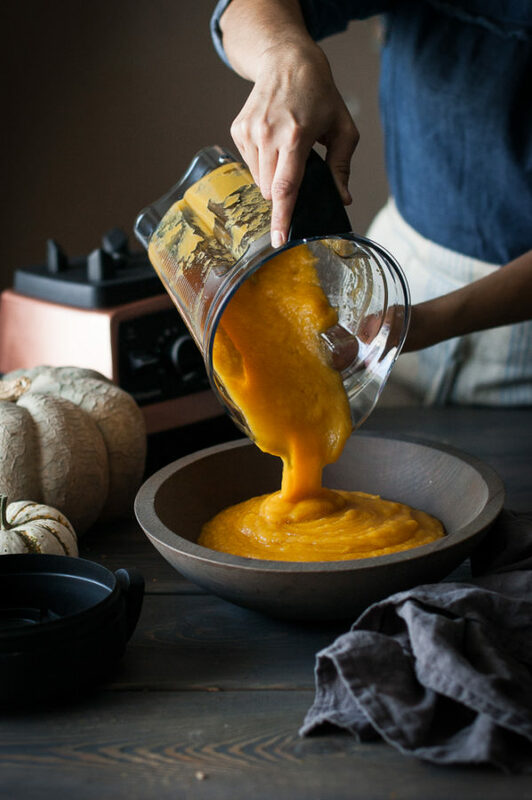 If you are not using the puree right away (and my guess is you won’t be using all of it right off the bat – depending on the size of pumpkin you roast you can end up with a LOT of puree) then I would recommend freezing what you don’t think you’ll use. I pour my pumpkin puree into Ziploc bags in 1 cup increments, label, date, and freeze so that the bags are flattened and stacked upon each other. 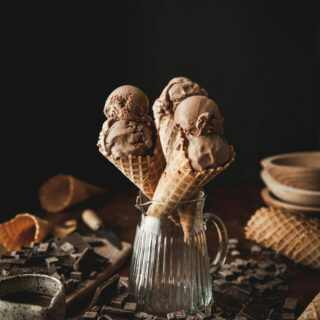 This way the puree freezes in a thin layer with thaws quickly under warm running water whenever you might need to use it, along with the 1 cup being a good amount for most recipes. I always have pumpkin left over when I use canned, don’t you? Cut the top stem and bottom knub off of the pumpkin and cut both halves in half again so that you have four quarters. If you are using a really large pumpkin you may want to cut in into six's or oven eighths. Place the sheet pan in the oven on the middle rack and roast the pumpkin at 400 degrees for 30-45 minutes. Length of time will depend on size and thickness of pumpkin quarters. Pumpkin is cooked when a fork pierces the flesh with ease - it should be very tender. Using your hands, peel the skin off of the pumpkins. Use a small knife to cut off any skin that doesn't readily pull back. 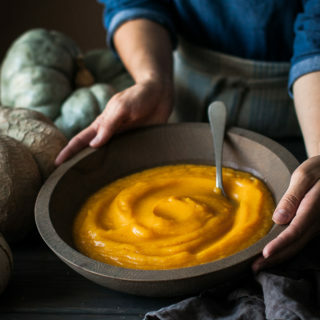 If you are not using the puree right away (and my guess is you won't be using all of it right off the bat - depending on the size of pumpkin you roast you can end up with a LOT of puree) then I would recommend freezing what you don't think you'll use. I pour my pumpkin puree into Ziploc bags in 1 cup increments, label, date, and freeze so that the bags are flattened and stacked upon each other. 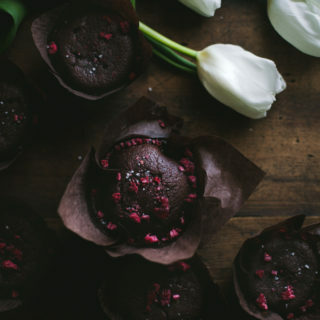 This way the puree freezes in a thin layer with thaws quickly under warm running water whenever you might need to use it, along with the 1 cup being a good amount for most recipes. I always have pumpkin left over when I use canned, don't you? 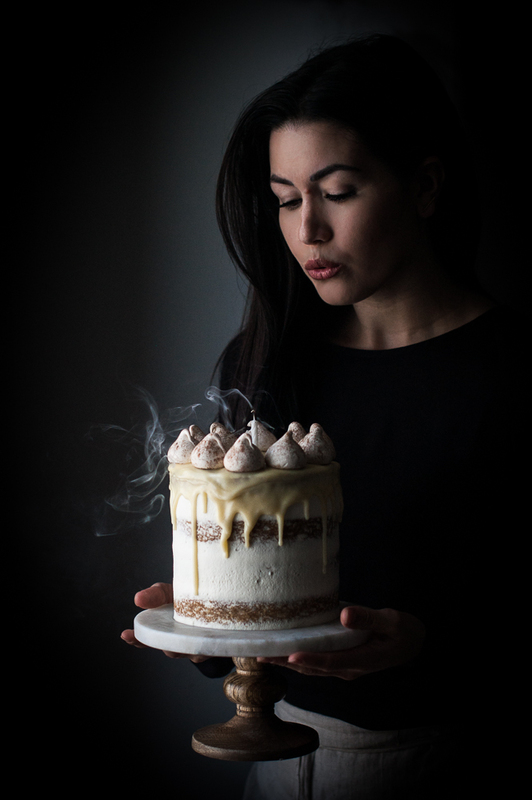 « Vanilla Bean Butter Cake + White Chocolate Mousse & a 3 Year Blogiversary!